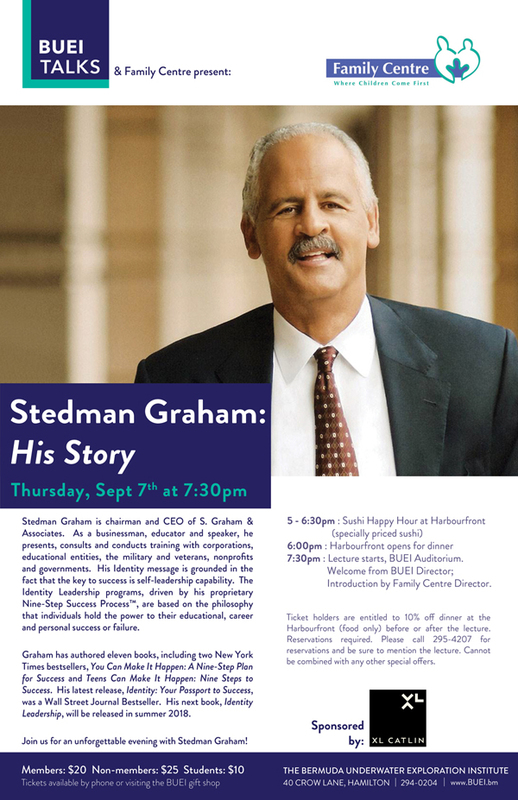 The Bermuda Underwater Exploration Institute’s [BUEI] and Family Centre is getting set to present “Stedman Graham: His Story” on Thursday, September 7th, beginning at 7.30pm at BUEI Auditorium. A spokesperson said, “A host of events is planned around the visit of Stedman Graham, Chairman and CEO of S. Graham & Associates and life-long partner of media mogul, publisher and philanthropist, Oprah Winfrey. Thanks to Graham’s friendship with the Family Centre’s Executive Director, Martha Dismont, he will be returning to Bermuda’s shores for a line-up of exciting events. “On Thursday, Sept 7th Graham will be the keynote speaker at a lunchtime roundtable discussion sponsored by XL Catlin titled “Cultivating Diversity and Inclusion through Authentic Leadership”. Other speakers at the event will include Ginny Ferson, Deputy Governor of Bermuda, Kathleen Faries, Head of Tokio Millennium Re Bermuda, Erica Smith, Executive Director of Bermuda Economic Development Corporation, Martha Dismont and moderator of the event, Cathy Duffy, Senior Vice President and Underwriting Manager at XL Catlin. This event is by invitation only with a limited number of seats available. “Later that evening, Graham will speak at the Bermuda Underwater Exploration Institute as part of the BUEI Talks series. His lecture titled “Stedman Graham—His Story” will focus on his personal story and how he has become an expert on Identity. The event starts at 7:30pm on Sept 7th. Tickets are $20 for BUEI members, $25 for non-members and $10 for students. Call 294-0204 to purchase tickets. For more information on the talk, visit www.buei.bm. All funds raised from this event will be donated to the Family Centre. Does he have a work permit? has there ever been a follow up to his previous visits? has he ever assisted anyone in Bermuda? what steps has he shared that made a difference in our lives? what a waste, giving money to this man who is associated with the only Black female billionaire! Comeon people lets do better stop paying everyone outside of Bermuda to fix our problems!